St Johns Cadets at Skegness Miners Holiday Camp. See note below. Photo courtesy of John Jennings. 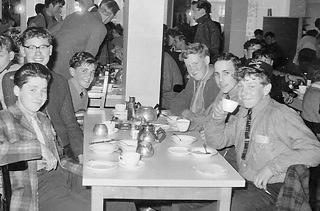 St Johns Ambulance Brigade Cadets at Skegness Miners Holiday Camp. Left hand side – from front to back: Brian Smith, John Jennings, Keith Hilton. Right hand side – from front to back: Tony Cawkwell, ? ?, Ray Gardner. Can anyone fill in the missing name please?